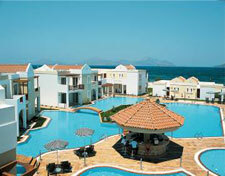 The luxury first class hotel was opened in spring 2004 and is situated 4km from Mastihari and 17km from kos town. On an area of 50.000 m2 and directly at the sea, a modern holiday area of the special kind was built. It is a long, sandy beach, very popular; it attracts many visitors because it is a nice beach within a beautiful environment and it is found very close to the town of Kos. Also, it is very well organized, offering several swimming, sunbathing and sea sport facilities. Several traditional taverns and cafes offer snacks and cool refreshments but also a full meal. Accommodation facilities are also available in the area. Access to the beach from the town of Kos is very easy by bus, with frequent service, by taxi and of course by rented and private car and motorbikes. If you have a yacht, you may reach the beach by sea; facilities of mooring are available in the small port.